you play guitar, Digr? How did I not know that? , Oh, no. No. Nooooo. I used to play AT the guitar. He did one of the more awesome covers I've ever heard. It was some kind of White House performance in praise of Paul McCartney. Barry and Michelle were there, front row center, with Macca. Grohl comes out, and with the house event band, does Band On the Run, like, ten feet in front Sir Paul his own self. That's the second gayest song ever. Built this city, being number one. How does one rock that song? I shudder to think. Neither of those is nearly as gay as Relax by Frankie Goes To Hollywood, btw. I do believe that Band On The Run belongs in that thread of songs with non-sense lyrics you started, though. Nonsense, Band on the Run is a great song, even John Lennon loved it. I love it. We did it in Shabbey Road when we had a lady singer who could reach Paul's range. I borrowed this guitar. I had to borrow one because my guitar don't fly. I cut the truss rod groove today. I had to slow down and think it through, and then I needed to go procure a few things to make a jig I can reuse. Took me 3 days of ruminating and 2 1/2 hours of grubbing around Lowe's to get to where I felt ready. Thing was, I had the neck traced out on the blank, and went ahead and cut out the head stock cuz I wanted to do that last stuff I did ^^, but I didn't think to align the center line. I could have used the edge of the blank as a guide for the router. 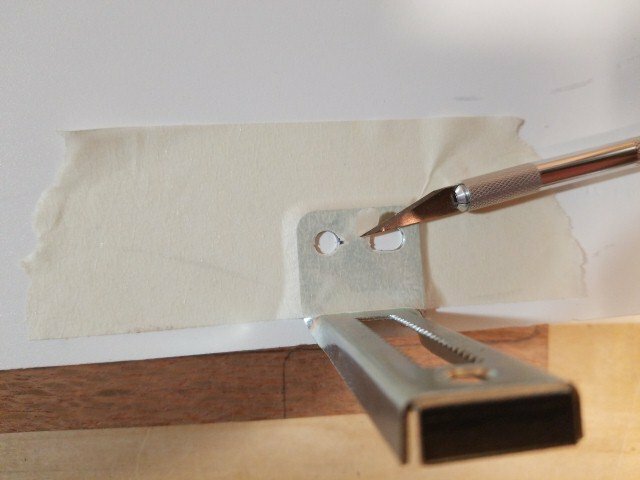 It wasn't far off, so I think I could have faked it if I had decided to re draw it parallel to the edge, but I figured that if I made a jig, I could probably use it for future projects. 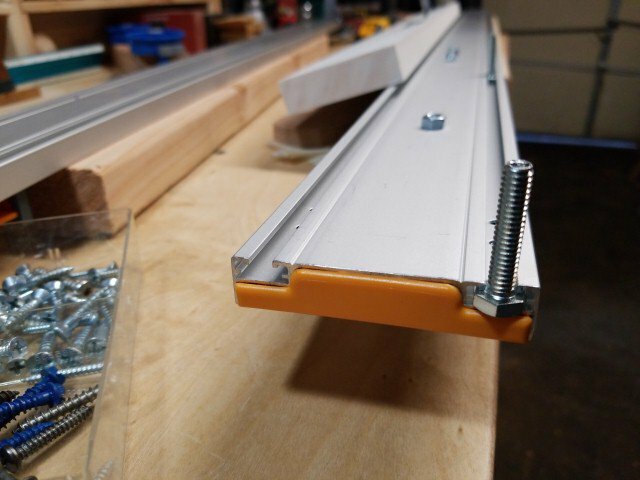 The rail clamps onto a board, and then there are tracks that accept a bolt. This is a 1/4" #20 x 2.5"
I bought a board made of some kind of light plastic because I wanted it to be slippery and straight. $22 for a 5/4 x 4x8. Cut that into 2 3' rails and attached these brackets. I set it on the neck because I knew that was flat and taped them. Cut out the screw holes and mounted them. I checked the level-ness of the neck, and the 2 rails using the bubble level app on my phone, so I know it's extra precise. Last edited by lumberjim; 12-03-2018 at 02:12 PM. I glued the plywood down to the bench along side the neck so that it was all flat, tight and immobile. so, now that I have the router aligned, and the rails mounted on the 3/4" plywood I just need it to stop at the right place so I don't cut through the end of the neck. same thing on the other end, and now I have stops that keep the length of the groove exact. Last edited by lumberjim; 12-03-2018 at 02:10 PM. i trimmed this, but the first thing I did was set the bit to just barely touching the wood, and dragged it back and forth to confirm that it scribed a line right on my drawn line. It did. so then, a couple light passes and check again. .... but perfect it is. So that's done. Next thing is gluing on the fret board. Which means the next thing is planing that down to 1/4" and sanding or planing a radius onto the surface. If you imagine a big circle...20" diameter would be a 10" radius.... and imagine the 2 1/4 inch guitar neck's surface fitting perfectly inside one section, crosswise. you can visualize the curve on that surface. Some necks have a compound radius. That is, the radius at the top, near the nut might be 10 and the radius at the 12th fret is a 16... so vaguely cone shaped.... the flatter lower part makes shredding easier. I may or may not attempt that. probably not on this build. So, I'll be doing some more cogitating.